Michael Redmond 9P has made it to the third round of the Tengen, his best result in some time. He defeated Cho Riyu 7P on March 4th and then Ishida Atsushi 9P on April 1st and is now paired against Yoda Norimoto 9P. Redmond is three years older than Yoda, but both are in the same generation, though Yoda has had a much more successful career in terms of title wins. Cherry Blossom tournament in Washington, DC last weekend. Over 40 players participated in the event, which was held amidst perfect weather and blooms at the annual DC Cherry Blossom festival in downtown Washington on Saturday, April 3. 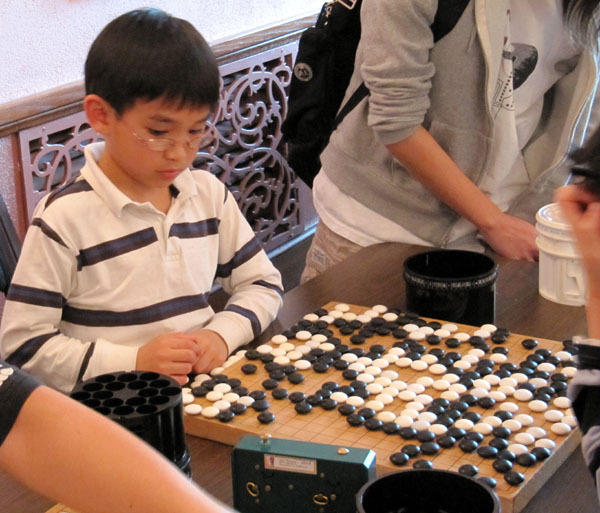 “Of special note was young Ethan Hsiao (photo), playing in his first tournament at 35 kyu,” reports TD Allan Abramson. “He went 3-1, and received a special trophy for his efforts. In celebration of the cherry blossoms, no tie-breakers were used for second place, so we had more winners than usual!” Abramson, who has directed local tournaments for two decades, announced his retirement from tournament direction on Saturday and was promptly punished by the go gods with his worst cold in decades, but reports that he’s recovering now. Winners Report: First place: Edward Zhang 6D, 3-1; Stephen Tung 1k, 4-0; Kelsey Dyer 2k, 4-0; Kevin Chin 4k, 3-1; Raymond Yeh, 6k 3-1; Xiaoting Hu 7k, 3-1; Min Soo Kang 11k, 4-0; Gary Smith 12k, 3-1; and Melody Chao 24k, 4-0. Second place: Zhenying Gu 5D, and Keith Arnold 4D (tie); Justin Teng 3D; Gus Heck 2k, and Yukino Takehara 2k, and Ching-Sung Chin 3k (3-way tie); Jerry Chen 4k; Sam Zimmerman 5k, Bob Ehrlich 5k, and Mike Lash 6k (3-way tie); Joey Phoon 7k, and Gurujeet Khalsa 8k (tie); Alex Yen 9k; and Ethan Hsiao 35k. Edward Zhang 6D won the first place in the Open section of the 2010 Carolina Spring Go tournament, held in Raleigh, NC on March 28th. Thirty-four players competed in the seventh annual AGA-rated tournament organized by the Cary Go Club. Zhang, who traveled from the DC area, won four straight games to top the open section. Winner’s Report: Eric Zhang 5D, Guojun Zhu 3D and Nianci Gan 3D tied for the second place of the open section with 3-1 scores. Xiaoping Wu 1d and John Moore 2d tied for the first place of Section A (1D-2D), while Wu’s 12-year old son, Brian Wu 7K won Section B (1K-10K) with a perfect score of 4-0. Warren Lewis 18K, Tom Carlson 11K, Dale Blann 13K and Ralph Abbey 15K tied for the first place of Section C (11K-20K) with the same score of 3-1. Two young kids, Alvin Chen 24K and Kevin Kwong 25K won Section D (21K-30K) in a tie with a score of 3-1. Recruiting has begun for a new tournament, the Wisonet Go Cup. A “slow go” event – 2.5 hours basic time per player plus overtime – the Wisonet is requiring a minimum rating of 1-dan and will select a field of up to 32 players from those registering. Five rounds are planned, the first scheduled for May 8th in Edison, New Jersey. Rounds 2-4 can be sponsored by other go clubs and the final round will return to Edison. Up to $3,000 in cash prizes will be awarded (less if the field is smaller). Players invited to participate in the tournament will pay $50 per round for the first three rounds; no fee will be charged for the last two rounds. Wisonet specializes in games and puzzles, says company president and tournament organizer Ronghao Chen. “Our purpose is to dramatically improve the quality of games in tournaments.” Chen expects the tournament to last at least four months. “This type of time arrangement will allow players to have time to prepare games,” he says. “Go fans will have time to discuss games and the tournament. Also, it will attract the general public to learn go and be aware of the tournament. 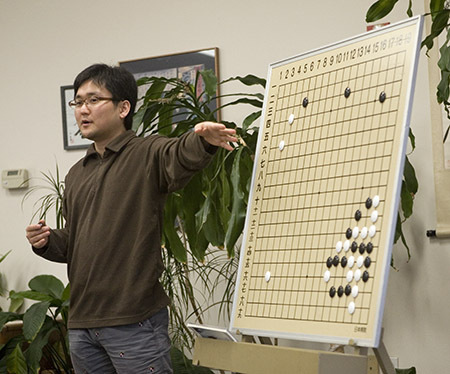 Live game analysis will be arranged at many playing days.” Dan level players interested in a seat in this tournament must sign up by April 15th by e-mailing his/her name, current AGA rating, phone number and e-mail address to chenronghao@yahoo.com. Invitations to all selected players will be sent out on April 25th. For more info call Chen at 609-799-1624 or 908-872-6202. After two weeks of intense competition, California teams have trounced the competition, leading many of the standings. In the Open Division, Redwood Shores GC and Orange County GC are holding onto the top spots for the Golden State, but defending champion Stuyvesant HS (NY) is still in the hunt for their third open title by remaining undefeated through two rounds. Richard Montgomery HS (MD), Bellaire HS (TX), Morningstar Chinese (CA), Mason Huaxia Chinese (OH), and Saratoga HS (CA) also lead their divisions with solid 2-0 performances. In the States Cup standings, New Jersey is looking for their first-ever podium finish, clinging on to the third spot behind California and New York. North Carolina and Texas round out the top five. Saratoga HS (CA) hopes to claim their second sweepstakes title, given to the school team with the highest total score. However, they only hold a two-point lead over last year’s Rookies Cup Champions, Hunter College HS (NY). Fair Oaks ES is currently in third as they attempt to become the first-ever junior team to finish in the top three. Morningstar Chinese’s debut performance has rocketed them to the top of the Rookies Cup as they look virtually untouchable for this award, while Cary Chinese (NC) will seek their second consecutive Junior Cup, as they seek to break the national record they set last year. Third round coverage begins this weekend, and the push to earn medals begins now. Click here www.aghs.cc for complete results. Meadowdale High School’s “Team Lightning” from Lynnwood, Washington won the 8th annual Iwamoto School Team Tournament at the Seattle Go Center, winning all of their games but one to best two other teams. First board: Cesar Serra, 2nd: Hayden Sherrill, 3rd: Andrea McCool. Suen Guy 6k from Korea, a senior at Iowa State University studying electrical engineering, won first place and the All-Iowa Go Cup during the Iowa Go Tournament on March 27 in Ames, Iowa. Returning Iowa Go Tournament champion Louis Schenck 2k from Des Moines, Iowa, took second place. Edward Basom 10k, from Cedar Falls, Iowa, an Iowa State University junior studying chemistry, took third. -report/photos by Carol Bodensteiner: photos: Suen Guy, tournament winner; Louis Schenck, runner up. North America’s Mingjiu Jiang 7P was eliminated in the first round of the Chunlan Cup on Saturday in Beijing, China, as was Europe’s Csaba Mero 6d. After the second round on Sunday, the field was down to eight: Heo Yeongho 7P, Kong Jie 9P, Lee Sedol 9P, Wang Xi 9P, Xie He 7P, Cho Chikun 9P, Gu Li 9P and Gu Lingyi 5P. Lee of Korea and Japan’s Cho are the only non-Chinese players remaining. The Chunlan Cup is sponsored and hosted by The Chunlan Group of China. The beginning 24 players are shortened to 16 after the first round and the top eight players are qualified for the next round while the bottom eight play each other in a knockout tournament. Komi is 5.5 points with 3-hour time limits. The winner’s purse is 1,000,000 Yuan ($150,000). Click here for current standings, courtesy Kin’s Go News, here is the Chunlan Cup tournament line up and team members and here for game records. LOCKHART & XIONG WIN BOSTON YOUTH: Ben Lockhart 5d from New York City won the Senior Division and defending champion Kevin Xiong won the Junior Division again at the 4th annual GBCCA Youth Go Tournament and US Youth Go Championship (USYGC) Qualifier that ended on March 20th. Runners-up in the Senior Division were Andrew Wang in second place, Henry Li (3rd) and Sam Huang (4th). Zachary Lu took 2nd in the Juniors while Bowen He was 3rd. MYUNGWAN KIM 9P WORSHOP GIVES NORCAL PLAYERS A BOOST: Thirteen students gathered last weekend to listen to lectures, ask questions, solve problems, have their games reviewed, and play against Myungwan Kim 9P, a top pro from Korea and winner of the U.S. Open two years in a row. At the March 20-21 workshop in Berkeley, CA, Kim took questions from students, and spent a lot of time discussing techniques for assessing the value of different endgame moves, a popular topic among the attendees. The workshop was sponsored by Bay Area Go Players Association, and organizer Roger Schrag plans to schedule two more pro workshops in the area this year.